I am a journaler. Since I was about 15, I have scribbled thoughts and quotes on little scraps of paper here and there. I finally started to buy journals to write in. 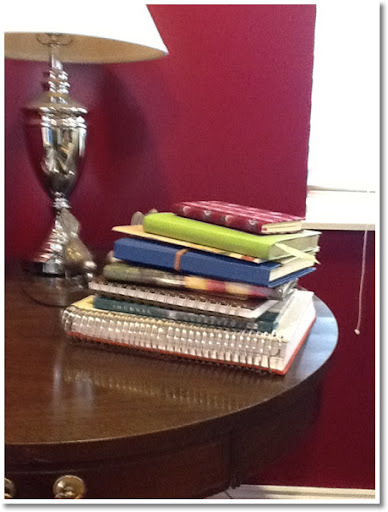 I have a couple of travel journals, a couple of praise and worship journals, and a few day-to-day journals. Here's a picture of some. These are a reminder to me that life is fleeting. The large one on the bottom of the pile was written in 9yrs.Don't think those were boring years just because it's not very big. Some days were of course rather dull, but other days I would've welcomed dull! In 9 yrs I welcomed 5 new grandchildren, traveled to some very exciting places, taken care of a very sick husband, seen our church build and relocate and said good-bye to some dear people in my life including my daddy. The Bible has much to say about the brevity of life. These journals remind me of "We spend our years as a tale that is told." Psalm 90:9. I would change a lot of things if I could, but since I can't , I will allow my failures to push me closer to the Lord and to learn from them. May the message I leave behind be one of a constant and faithful God who has led me all the way!